Laura and Boy have been training the german wheel for more than 20 years. In 2011, the two competitive athletes met at the World Championships, where both won gold. After many other titles, they began their career as artists. 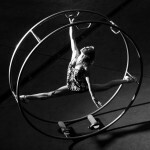 They developed shows in the German Wheel and learned many other acrobatic disciplines. Since 2012 the World Champion Duo is performing on international stages under the name ‘Wheel Sensation’. 2018 they performed more than 250 acts, german- and cyr wheel, aerial acrobatics, hand-balancing, pole and much more Laura and Boy master more than 10 different acts and combine air and ground acrobatics into sensational artistic shows. Boy Looijen grew up in the vicinity of Amsterdam (Netherlands), where he started gymnastics and german wheel in the sports club LH Krommenie at the age of 9. Already after a few years, Boy trained and competed internationally. 2007 he won his first world championships medal in the discipline spiral. After this great success he got in contact with Corpus Acrobatics Theater in Amsterdam. With them he expanded his acrobatics skills and learned to make a show from his competition exercises. In 2011 Boy competed for the third time at the world championships and won his first gold medal in the main discipline straightline. Not only as competitor and performer but also as a trainer is Boy successful. Since 2008 he is one of the main coaches for german wheel in the Netherlands. In fall 2011 Boy took part in the TV show “Hollands got Talent” and became 2nd. Sony Music Entertainment contracted him after this show. 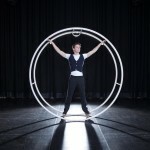 This success generated a lot of business and Boy started his own acrobatic company “Wheel-Sensation” to perform together with Laura Stullich. 2013 Boy kept focused on the competitive sport and won four medals at the World Championships in Chicago, one silver medal at the World Team Cup in Berlin in 2014 and another three medals at World Championship in Italy in 2015. 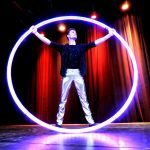 In addition to competitions and shows in theaters, circuses, cruise ships and corporate events Boy gives private lessons and workshops at his own studio “Circus Sensation” in Zaandam. By now Boy and Laura a known as professional artists, 2018 they performed more than 250 show acts at 80 different locations in various countries in Europe, Asia and America. Laura Stullich grew up in Marburg (Germany), where she learned the german wheel as a competitive sport in the sports club TSV Marburg Ockershausen. At the age of 10, Laura had her first experience with german wheel. In the first years of her career, she already took part in national and international competitions. After only 4 years in this sport, she was among the best in the world and got vice-worldchampion. Two years later Laura won four gold medals at the world championship in 2005. After graduating from high school she decided to perform and coach professionally in the USA. In 2010, Laura continued her successful career, winning 3x Gold and 1x Silver at the World Cup. During the competition, she met the Dutch athlete Boy Looijen. The two quickly came together and started a career as artists in the german wheel. Together they founded their own company “Wheel Sensation”. Since then, Laura has been on stage for over 8 years and performs acts at circus and variety shows, at business events, sports galas, on cruise ships and private events. In addition, Laura is active as a coach and passes on her knowledge to young athletes at home and abroad. In 2013, Laura was once again able to prove her skills. At the World Championships in Chicago she won again 2x Gold and in 2014 Silver at the World Team Cup in Berlin. In 2016, Boy and Laura bought their own training studio in Zaandam. There they train for shows, give workshops and private lessons. Since then, the two artists have been very successful. In 2018, Laura and Boy were on stage more than 250 times, at around 80 events, in different countries in Europe, Asia and America.